There’s nothing like homemade pasta. Most of the dried pasta options in our local markets is made simply from flour and water. 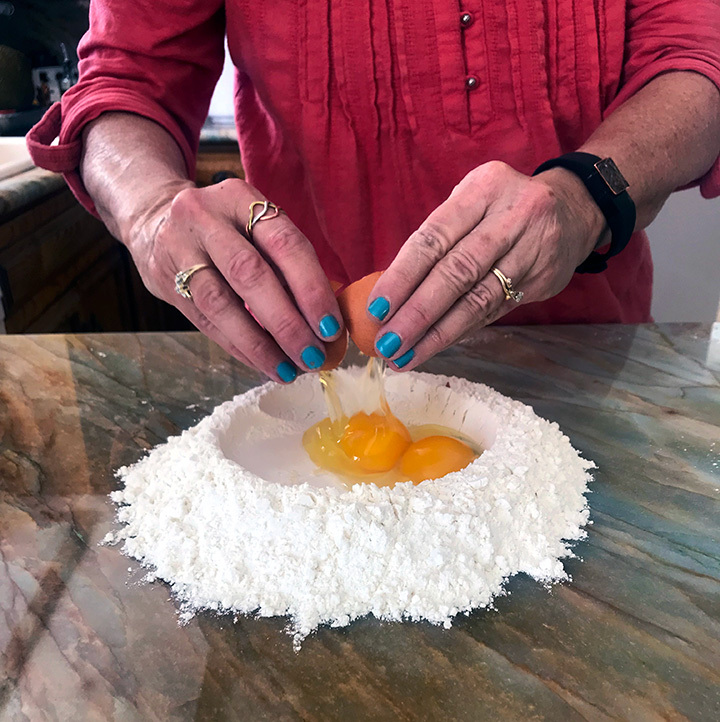 Fresh homemade pasta is made with eggs instead of water, boosting the flavor and the nutritional value by adding protein and vitamins A and D.
And, honestly, making pasta is just not that hard. 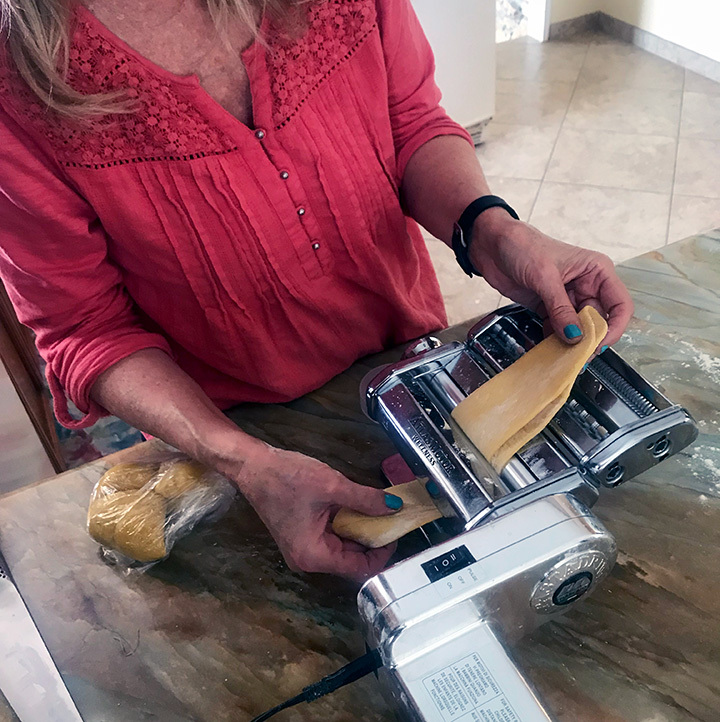 In fact, it’s really quite easy, something I just recently learned from my friend Judy, the pasta making queen. 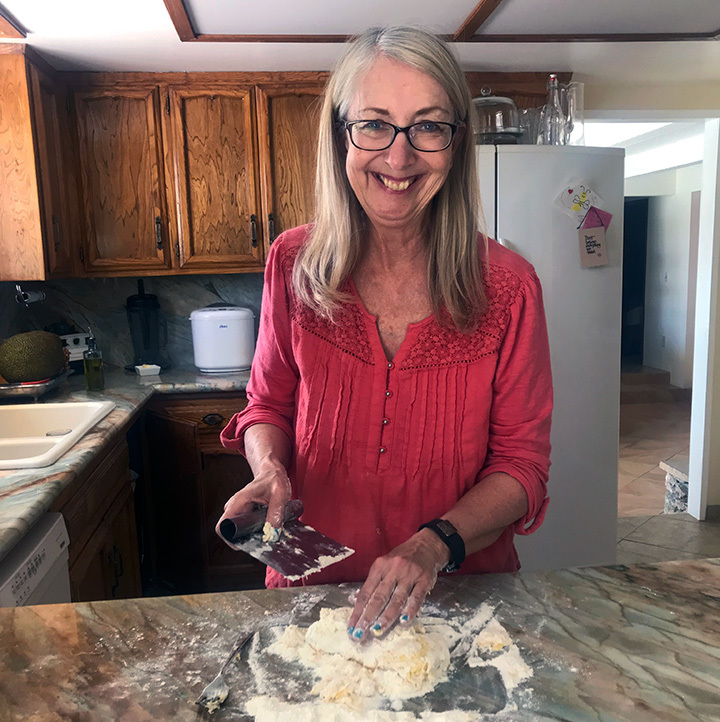 Judy lives in Southern California, so I only get to cook with her a couple of times a year when we visit. 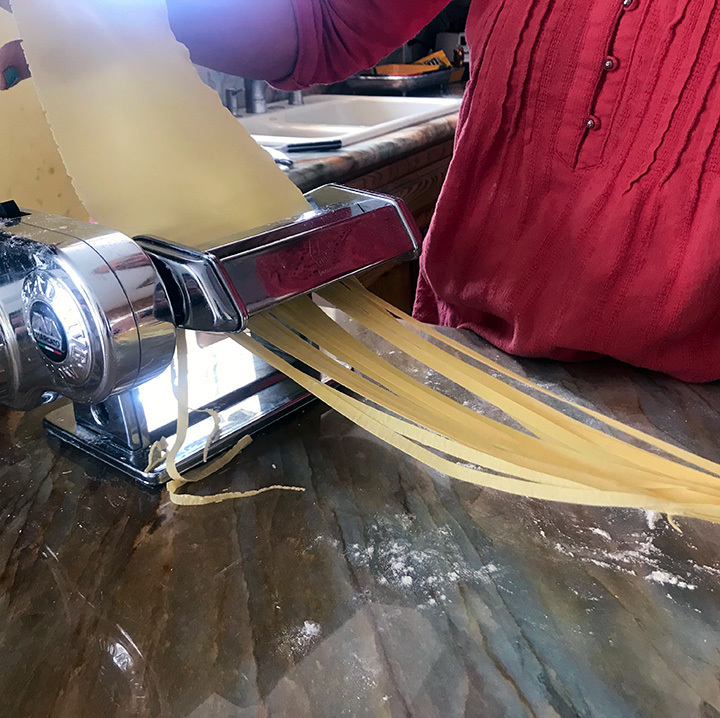 During our last visit, I asked Judy to walk me through the ins and outs of homemade pasta making while I took pictures each step of the way, and she graciously obliged. 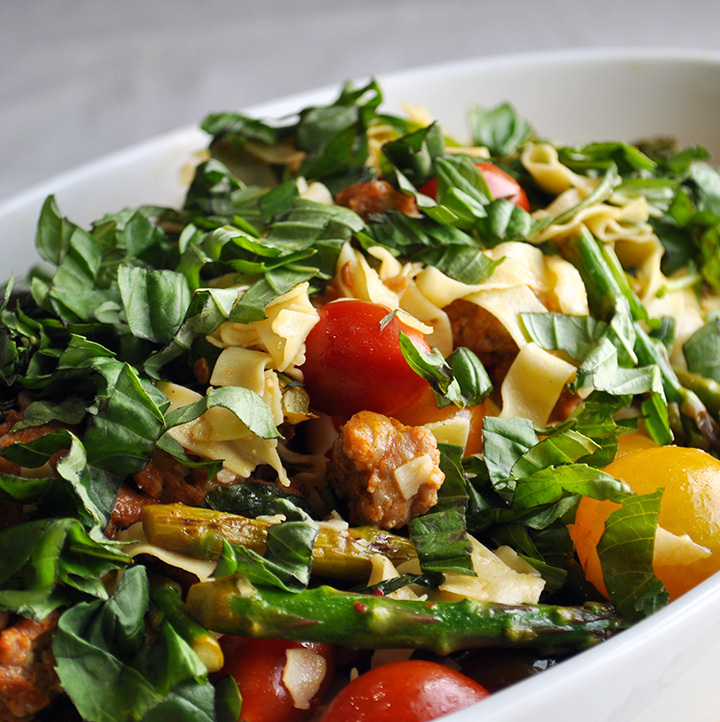 Below you’ll find the recipe we used to make this batch of homemade pasta. Below that you’ll find a step-by-step tutorial that will walk you through the process from start to finish. 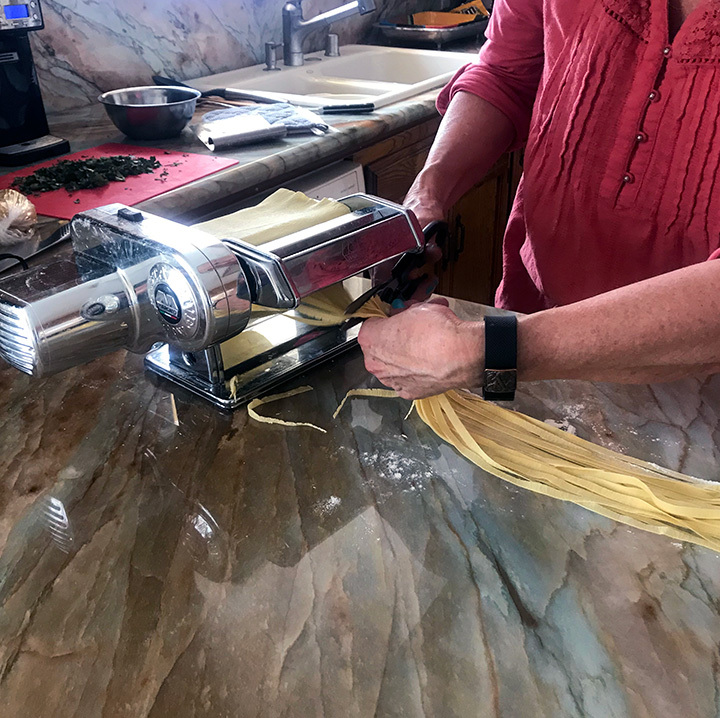 There’s nothing like homemade pasta, which is made with eggs, boosting the flavor and the nutritional value by adding protein and vitamins A and D. Making pasta from scratch is really quite easy, and incredibly satisfying. Dump the flour onto a pile in the center of a clean work surface. Use your fingers to mix the salt into the flour. Create a well in the center of the flour and crack the eggs and egg yolks into the center. Whisk the eggs around in the center of the flour to break them up and begin to incorporate them into the flour. Continue to whisk the eggs, gradually pulling more and more flour into them, until a soft, shaggy dough begins to form. This will take several minutes. At this point, it’s unlikely that all of the flour has been incorporated, which is ok. Using your hands and a dough scraper, continue to work the dough to bring it together. 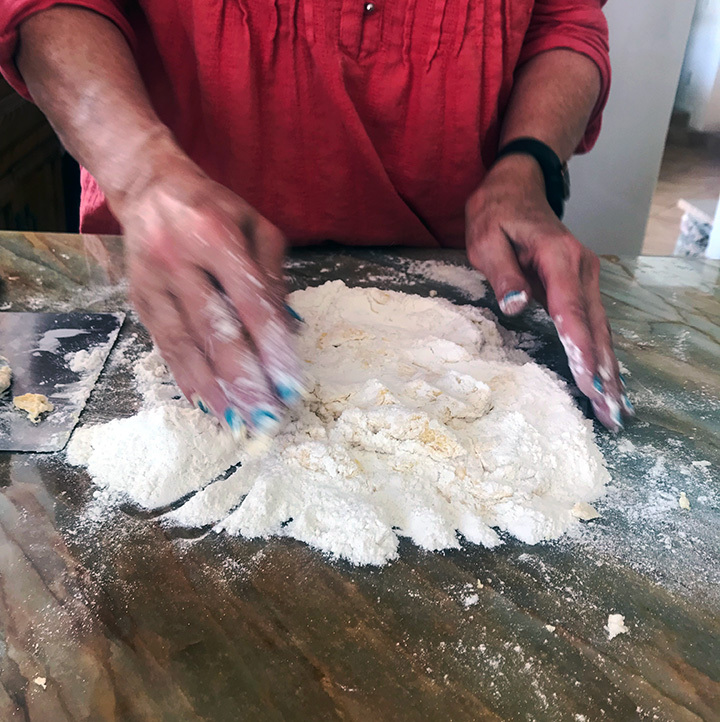 Once you’ve incorporated enough of the flour to form something that resembles dough, begin kneading by folding the dough on itself, flattening it out, and folding it again. The dough will be soft at first; as you knead, incorporate more and more of the flour. Continue until you have a smooth elastic ball of dough that is not sticky at all, but not so dry that it’s cracking, about 10 minutes. If you slice the dough with a sharp knife, you should see very few air bubbles. Wrap the dough in plastic wrap and let rest at room temperature for at least 30 minutes. The dough can be stored in the refrigerator for up to 24 hours; bring to room temperature before continuing. Unwrap the dough and cut it into 4 equal portions. 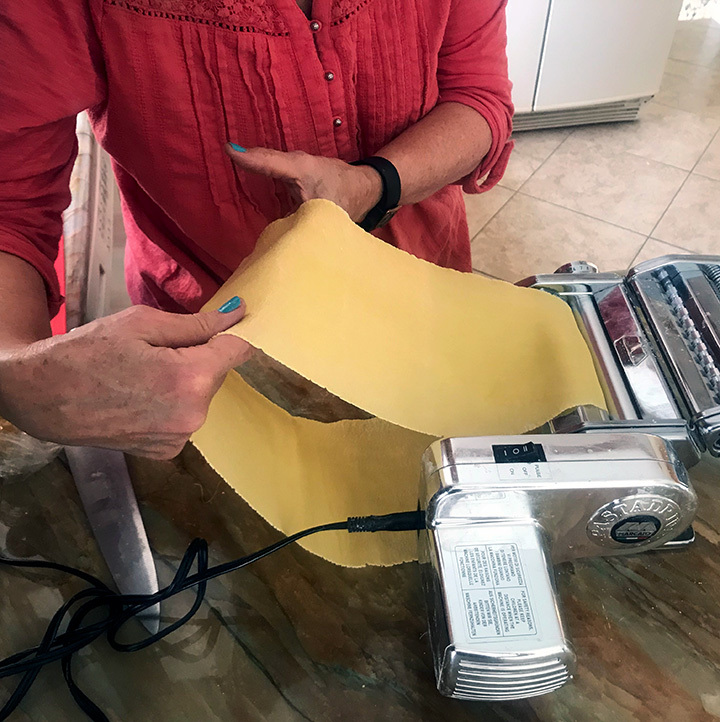 Working with one portion at a time, and keeping the remaining dough covered in plastic wrap, flatten the dough out a bit with your hands so that it’s thin enough to fit through you pasta machine. Set the past machine to the widest setting (usually marked “1”), and feed the dough through the pasta roller. Repeat 10-12 times; for the first 6 or 8 times, fold the dough over on itself before feeding it back through the rollers. 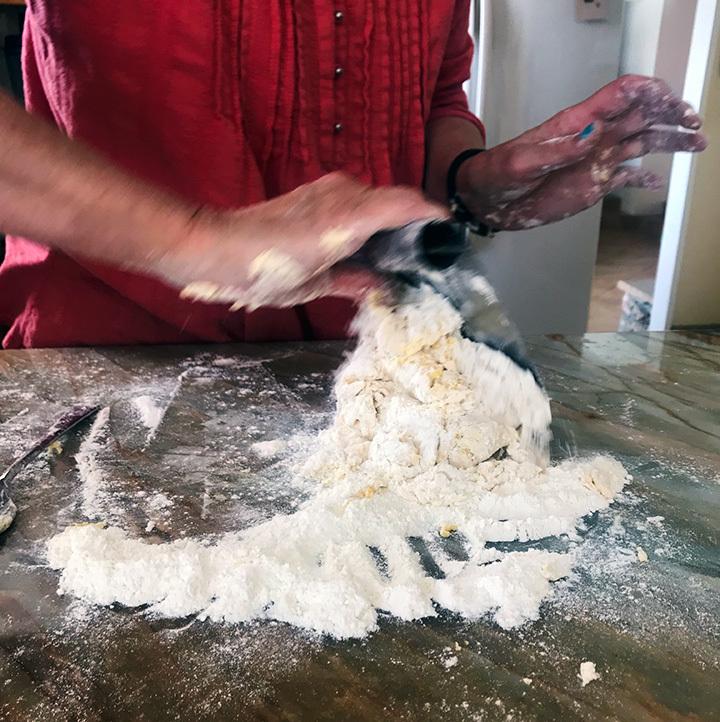 This process will help complete the kneading process, strengthening the gluten in the flour and giving the pasta a chewier texture. Continue to feed the dough through the machine, gradually changing the settings to thin the pasta. Turn the dial to “2”, and run the dough through the machine a couple of times. Turn the dial to “3”, and run the dough through the machine a couple of times, etc. Continue to change the dial settings until the pasta is as thin as you want it to be. For fettuccine, I normally go to 7 or 8. 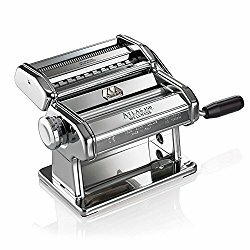 Now feed the long sheet of thinned pasta through the cutting rollers of your machine. Use kitchen sheers to cut the strands of pasta into the length you prefer. 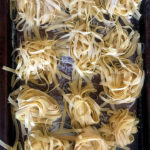 Toss the noodles with a bit of flour to keep them from sticking together and place in little piles on a baking sheet. Repeat with the remaining pasta dough. Cook the pasta immediately or let it sit for an hour or two to dry slightly. Fill a large pot 2/3 of the way full with water and bring to a rolling boil. Add 1 tsp salt to the boiling water and then add the pasta. Let cook for approximately 2 minutes. Drain and serve. 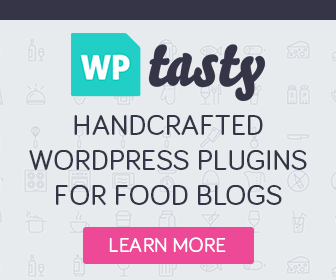 Look through several recipes for homemade pasta dough and you’ll see the same ingredients repeated over and over, flour, eggs, and salt, in various proportions. Find the proportions that work best for you. You want to create a dough that is soft and pliable, not wet and sticky or super dry. If your dough is too wet, kneed in more flour. If it’s so dry that it’s cracking, add another egg. Some recipes for homemade pasta dough call for a bit of olive oil, which adds flavor to the dough, but can cause the pasta to crack if it dries. If you’d like to incorporate olive oil into your dough, start with just 1-2 teaspoons, and don’t let the cooked noodles sit out more than 30-60 minutes before cooking. 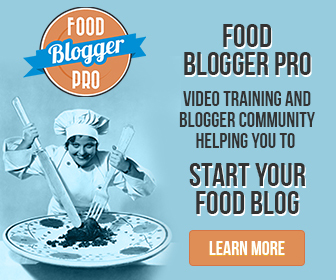 Some recipes also call for OO flour, also called “pizza flour”, which is higher in protein and more finely milled than regular all-purpose flour. This type of flour does lend a slightly silkier texture to the cooked noodles, but the difference is minor. You can also Semolina flour if you want your noodles to have heartier texture that sauces cling to a bit better. But, again, the difference is slight. Use whichever you prefer. Dump 2 cups of flour onto a pile in the center of a clean work surface. Use your fingers to mix the salt into the flour. 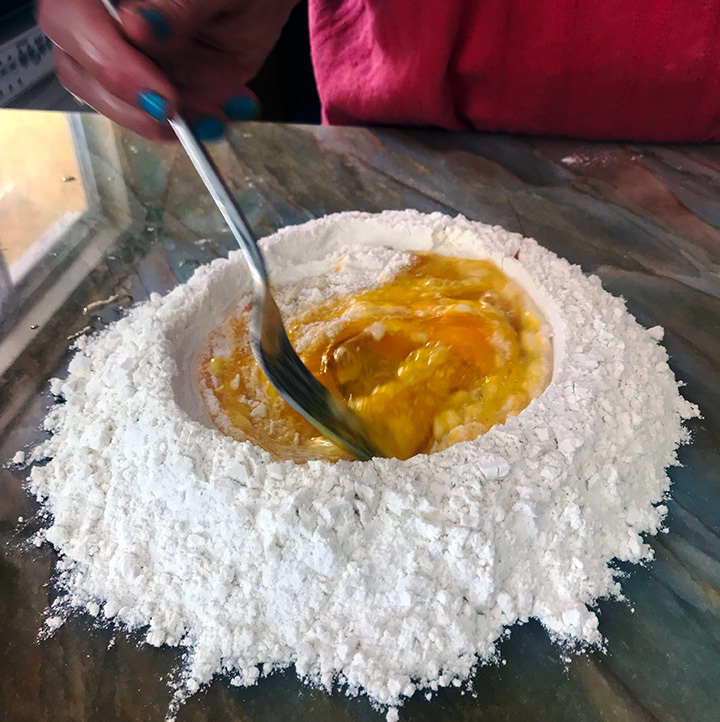 Create a well in the center of the flour and crack 2 eggs and 3 egg yolks into it. Whisk the eggs around in the center of the flour to break them up and begin to incorporate them into the flour. As you whisk the eggs, gradually pull flour into them. Continue to whisk the eggs, gradually pulling more and more flour into them, until a soft, shaggy dough begins to form. This will take several minutes. At this point, it’s unlikely that all of the flour has been incorporated, which is ok. Using your hands and a dough scraper, continue to work the dough to bring it together. 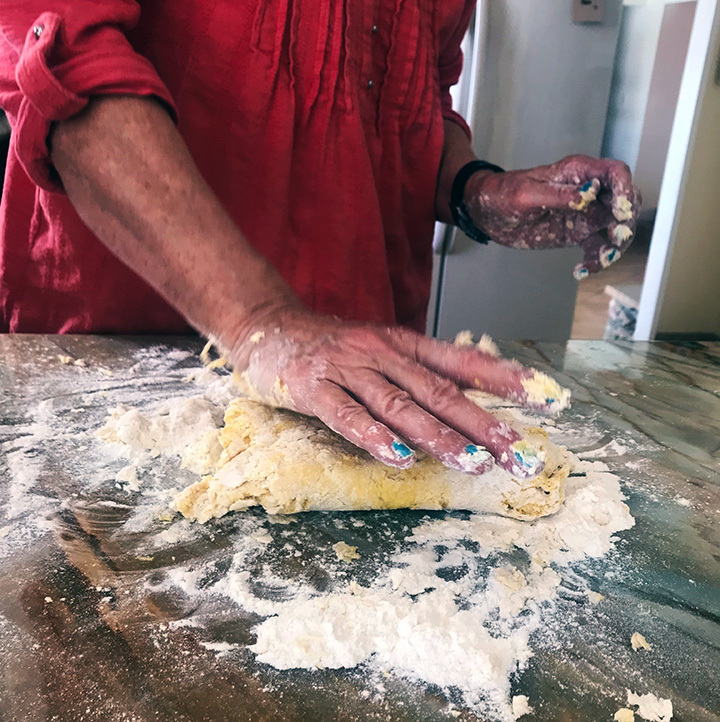 Once you’ve incorporated enough of the flour to form something that resembles dough, begin kneading by folding the dough on itself, flattening it out, and folding it again. The dough will be soft at first; as you knead, incorporate more and more of the flour. Continue until you have a smooth elastic ball of dough that is not sticky at all, but not so dry that it’s cracking, about 10 minutes. If you slice the dough with a sharp knife, you should see very few air bubbles. Wrap the dough in plastic wrap and let rest for at least 30 minutes at room temperature. The dough can be stored in the refrigerator for up to 24 hours; bring to room temperature before continuing. Unwrap the dough and cut it into 4 equal portions. 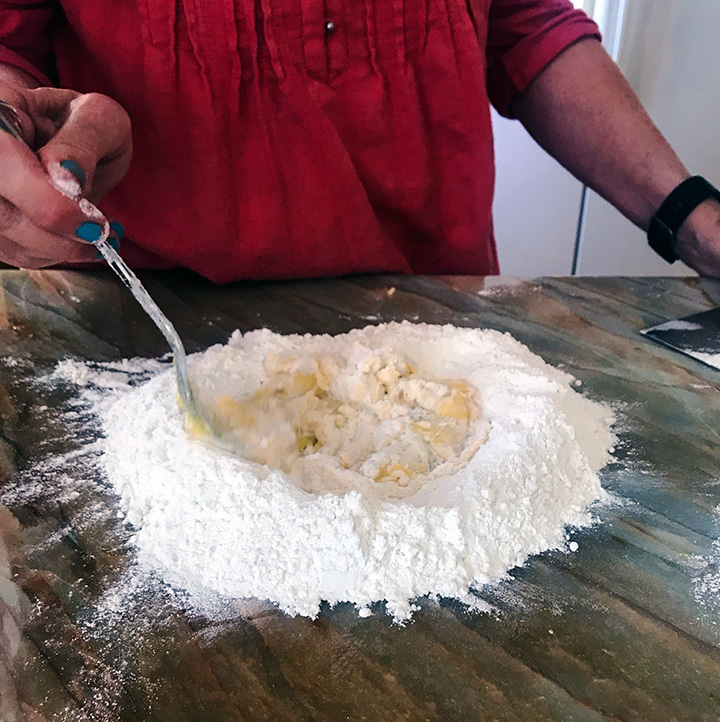 Working with one portion at a time, and keeping the remaining dough covered in plastic wrap, flatten the dough out a bit with your hands so that it’s thin enough to fit through you pasta machine. Set the past machine to the widest setting (usually marked “1”), and feed the dough through the pasta roller. Repeat 10-12 times; for the first 6 or 8 times, fold the dough over on itself before feeding it back through the rollers. This process will help complete the kneading process, strengthening the gluten in the flour and giving the pasta a chewier texture. 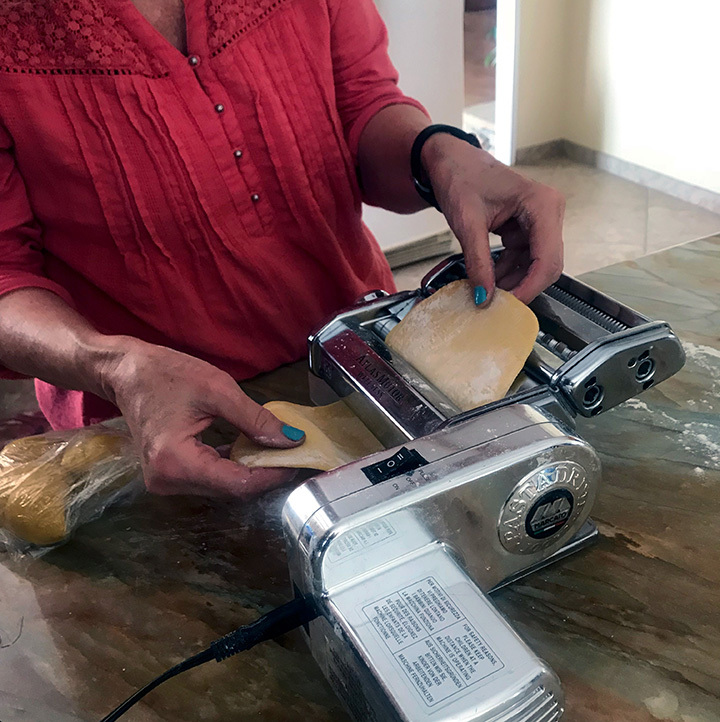 Judy has an electric pasta maker, allowing her to pinch the ends of the dough together and use both hands to feed it through the machine conveyer belt style. If you have a machine with a hand crank, you won’t be able to do this, as you’ll need one hand free to turn the crank. Ta-Da! 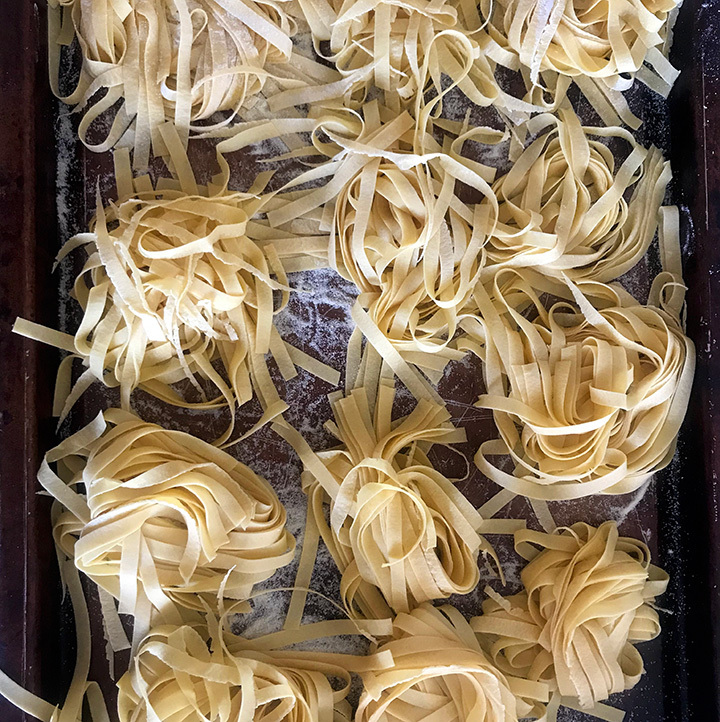 Gorgeous little piles of fresh homemade pasta, ready for cooking. At the end of our pasta making tutorial, Judy and I made a big pot of homemade marinara with Italian Sausage to accompany our homemade pasta. Then the four of us – Judy and her husband Jeff, myself and my husband Steve – dug in. And, I have to say, there’s something incredibly satisfying about a plate full of pasta and marinara that you’ve created from scratch. These mouthwatering homemade meatballs, simmered gently in rich marinara sauce, are tender, juicy, and packed with Italian flavor. 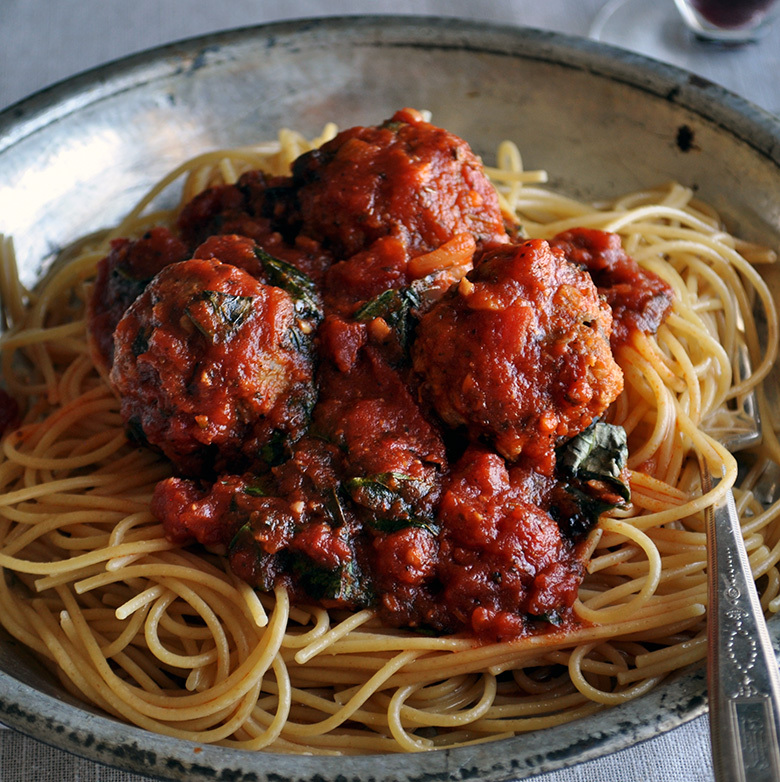 Serve on their own, over pasta, in meatball sandwiches, or on homemade meatball pizza. 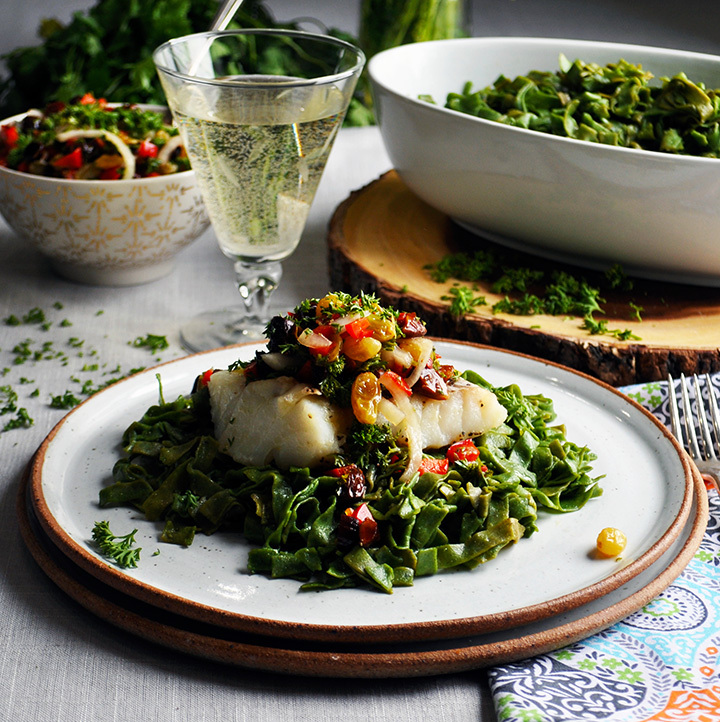 Bright green spinach pasta is topped with simple garlic and lemon marinated baked cod and covered in Agrodolce, a colorful, sweet and sour Italian condiment that turns a simple meal of pasta and fish into a gourmet feast. Yumm! What a great article, wonderful instruction and beautiful photos! Looks like lots of fun!